The BVI has experienced kaleidoscopes of thousands of quiet flying insects since October 2015. 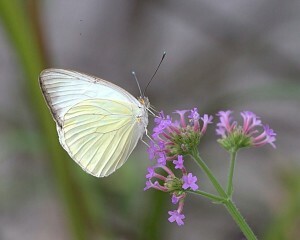 The Great Southern White Butterfly, whose scientific name is Ascia monuste eubotea has been spotted in swarms moving with the winds throughout the hills and valleys, along the carriageways, in the villages and at sea, as they fly to and from the various islands and in our capital, Road Town. The swarms of butterflies, which are whitish in colour and beautiful to observe, have a wing span of about 3 inches and when their wings are open, the adults are white in colour with brown or grey wing border markings, especially in the females. However when their wings are folded, the colour is yellowish-white with brown markings. Acting Chief Conservation and Fisheries Officer, Mr. Kelvin Penn said, “Here in the BVI, the females have been observed to lay their eggs on leaves of two native tree species, and the leaves are eaten by the green coloured caterpillars or larvae. After about a week to ten days of eating leaves, the larvae climb onto to a solid surface and spin their silk cocoons, which are brown in colour, to form pupae.” He noted that the pupae remain suspended for several days after which they emerge as new butterflies. The Great Southern White butterfly may be found not only in the Virgin Islands, but throughout its range of the southern United States, Cuba to Puerto Rico, Anguilla to Trinidad and Tobago, as well as South America and Central America. This year the BVI has seen unusually large swarms of the Great Southern White butterfly. Mr. Penn does not attribute the high occurrence to mass migrations from other locations outside of the BVI. Instead he has stated that the BVI has mostly experienced the presence of the non-migratory female butterflies. This mass presence of Great Southern White butterflies may be a cyclic pattern occurring every five years or so. It is an ecological phenomenon that should be noted and observed in the future. The presence of the butterflies reinforces the BVI’s need to continue to protect its biological diversity, including our native trees, butterflies and other natural biodiversity.